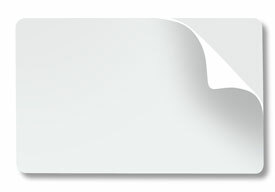 0.020" (20 mil) thick, adhesive back-pressure sensitive paper, white PVC card. CR-80 standard credit card size - 3.375 x 2.125 in. (85.6mm x 54mm).